ABOVE NAV, Sunroof, 3rd Row Seat, Heated Seats, Turbo, All Wheel Drive, PREMIUM PACKAGE, COLD WEATHER PACKAGE, PARKING ASSISTANCE PACKAGE, WHEELS: 22" X 9.5" FR & 22" X 10.5" R... PANORAMIC SKY LOUNGE LED ROOF, SPORT SEATS. Black Sapphire Metallic exterior and Black Vernasca Leather interior, xDrive40i trim. EPA 25 MPG Hwy/20 MPG City! Warranty 4 yrs/50k Miles - Drivetrain Warranty; READ MORE! Third Row Seat, Navigation, All Wheel Drive. Rear Spoiler, MP3 Player, Privacy Glass, Remote Trunk Release, Keyless Entry, Child Safety Locks, Steering Wheel Controls. PREMIUM PACKAGE Rear Electric Side Window Shades, harman/kardon Surround Sound System, Head-Up Display, Heated & Cooled Cup Holders, Soft-Close Automatic Doors, Remote Engine Start, Gesture Control, WHEELS: 22" X 9.5" FR & 22" X 10.5" RR BI-COLOR (Style 756), V-spoke orbit grey, Tires: P275/40R22 Fr & P315/35R22 Rr Run-Flat, COLD WEATHER PACKAGE Heated Front Seats Armrests & Steering Wheel, Front & Rear Heated Seats, 5-Zone Automatic Climate Control, PANORAMIC SKY LOUNGE LED ROOF, PARKING ASSISTANCE PACKAGE Rear View Camera, Surround View w/3D View, Parking Assistant Plus, SPORT SEATS (STD). BMW xDrive40i with Black Sapphire Metallic exterior and Black Vernasca Leather interior features a Straight 6 Cylinder Engine with 335 HP at 5500 RPM*. 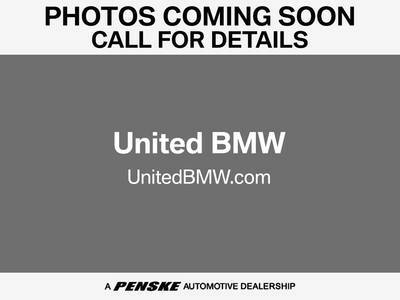 Blind Spot Monitor United BMW Promise United BMW is proud to be the #1 volume BMW dealer in the Nation as well as the largest retailer in Penske Automotive Group. BMW of North America has awarded United BMW with it's SIXTH consecutive Center of Excellence Award! United BMW is the only BMW dealership in Georgia to win this prestigious award!